Folks please send this report out to all of our friends around the world..
PEGIDA, a controversial European movement, plans to ‘send a message’ in a rally that has been denounced in the House of Commons and the Quebec legislature. 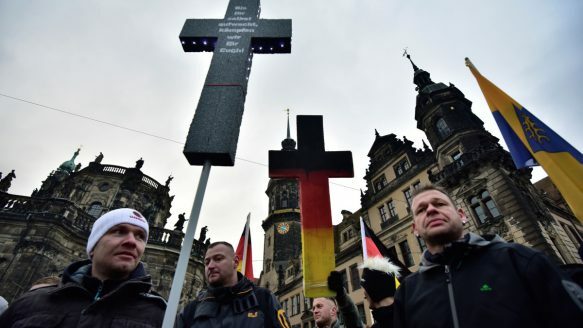 Supporters of the PEGIDA movement demonstrate in Dresden, Germany in January. The group has quickly gained mass appeal by demanding a more restrictive policy on Germany’s acceptance of foreign refugees and asylum seekers. MONTREAL—Islam needs to change or it needs to leave. That’s the message from one of the leaders who has brought to Canada a controversial European movement that unites political conservatives, anti-immigration activists and neo-Nazis with the goal of beating back a perceived rising tide of Islamic fundamentalism. Jean-François Asgard is one of five people to have launched PEGIDA Québec earlier this year, the latest branch of a global anti-Islam movement that was created last fall in the German town of Dresden. PEGIDA (the name is a German acronym for Patriotic Europeans Against the Islamization of the West) was founded by a convicted burglar-turned-graphic designer who planned a protest against the opening of 14 refugee centres in his city. It has risen rapidly, gathering more than 20,000 people at its peak and provoking warnings and denunciations from German Chancellor Angela Merkel. That has done little to stop its global growth and there are now branches across Europe, in Australia, Britain and the United States. There is also a national PEGIDA Canada group as well as a branch in British Columbia. “The incompatibility of Islam with the west is flagrant and that’s the reason that PEGIDA and the Western patriots are rising up. It’s not just to counter Islam but to say that if Islam doesn’t reform itself, Islam needs to get out of the west,” Asgard, 33, told the Star in the group’s first interview ahead of a controversial march planned for this weekend. Though the group is still in its infancy it has already been denounced on the floor of the House of Commons in Ottawa and condemned by members of Quebec’s national assembly for promoting hatred and fear at an already sensitive time for Quebec’s Muslims. “Its actions are directly targeting the Muslim community. Among its supporters, we find Christian fundamentalists and adherents of the (National Front of Canada), a movement that is clearly against immigration and ferociously anti-Islam,” wrote Québec Solidaire co-leader Françoise David in an letter published in Montreal’s Le Devoir. A protester holds a sign at the Hendrik Conscienceplein during a protest by the Belgian branch of the German group PEGIDA earlier this month. The rally, which PEGIDA is already touting as its North American grand opening, will start on the outer edge of Montreal’s “Petit Maghreb,” home to a number of the city’s North African — largely Muslim — businesses and residents. From there, Asgard said, it will head south with a planned stop outside the Islamic centre run by Adil Charkaoui, a man formerly accused of being an Al Qaeda sleeper agent. Charkaoui has come under scrutiny after it was revealed that a number of the seven young Quebecers who recently fled the country to join the ranks of the Islamic State had attended his Islamic dogma and Arabic-language courses. “We intend to make a stop there (at Charkaoui’s mosque) and, with the loudspeaker, it will send a message,” Asgard said, adding that the police have already given the group a permit for the march. A number of other groups, including one describing itself as anti-fascists, are planning a counter demonstration. “Although people are free to take part in demonstrations, we encourage them to abide by the rules of democracy,” replied Public Safety Minister Steven Blaney. In a Facebook exchange with the Star another of PEGIDA Quebec’s administrators explained that the group is a reaction to last October’s back-to-back terror attacks in Ottawa and in St-Jean-sur-Richelieu, Que., as well as a perceived failure of the provincial government’s failure to crack down on Muslim fundamentalists in Quebec. “It is all of those events as well as (Premier Philippe) Couillard protecting and consulting the fundamentalists instead of protecting us, so we must now do his job,” said the administrator of the Facebook page, who refused to provide his or her identity. None of the other organizers could be reached for comment. Asgard said that a group of five people came together in January to start PEGIDA Quebec. For the most part, the leaders of the group were previously administrators of other Facebook pages that are critical of the Islamic faith. Plans for Saturday’s rally began taking shape only in the last few weeks with a March 14 dinner meeting, where great attention was paid to security and secrecy. Attendees were required to provide a telephone number and personal photograph before they would be provided with details on the meeting spot. Asgard said there have been more than 100,000 visits to the group’s Facebook page and between 300 and 400 people have shown an interest in attending the Saturday rally. He said he would be happy if even 100 showed up. So far, the group appears to have gathered several dozen individuals ranging from sovereigntist supporters who have displayed their loyalty to the Parti Québécois, to fans of skinhead punk bands, to others whose social media profiles make reference to the Roman Catholic Crusaders of the Middle Ages.